Winter Greenhouse Sale! Order Now and Save! Hurry! All of our greenhouse kits are currently on sale! Don't forget to ask about our Greenhouse Financing Plan! Come visit our huge greenhouse sale! 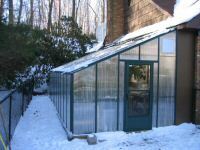 Backyard Greenhouses offers more than 8,000 greenhouse models and sizes to choose from! 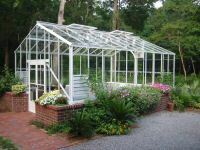 Our Feature Greenhouses are offered at special discounted pricing, and there are many styles choose from. Selections include single tempered glass, double tempered glass, twin wall polycarbonate or our new and improved five wall polycarbonate! Whether you are considering a free standing greenhouse, custom greenhouse, lean-to home attached greenhouse or a commercial greenhouse, you won't be disappointed at Backyard Greenhouses. Call one of our greenhouse consultants today at 1-800-665-2124 or email shelley@ecolad.com to receive your free greenhouse quote.